After a friend and I discovered great swaths of bluebells and eryngo at the Brazoria Wildlife Refuge, I decided to return for a day of solo exploration, and July 4 was my opportunity. Stopping for a quick survey of the planted gardens, I noticed what I assumed to be a late Texas dandelion blooming in the mowed grass edging the parking lot. A second look revealed something entirely different. 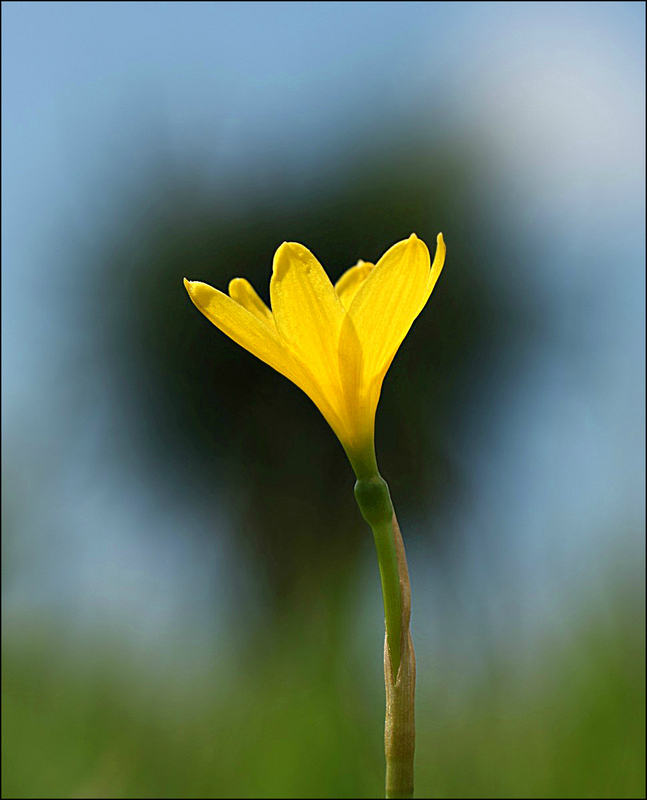 A yellow rain lily was glowing in the sunlight, and at the very moment I recognized it, my day was complete. I first encountered one of these lilies at a local nature center, and spent a good bit of time trying to identify it. Later, I found patches of them at Armand Bayou, and in the process of writing about them, satisfied myself that I’d found Zephyranthes smallii. Still, my original identification had been provisional, so I emailed a pair of photos to Thomas Adams, botanist at the Mid-Coast National Wildlife Complex, which includes the Brazoria refuge. After noting that it’s sometimes difficult to distinguish between Zephyranthes citrina and Zephyranthes pulchella, he added that, given the equal size of the stamens and the short perianth tube, it seemed likely that I had stumbled across Zephyranthes pulchella: a Texas native that historically has been found close to Brazoria County. Other surprises would come that day, but nothing could equal this bit of explosive color — an example of floral fireworks that seemed made for a day of celebration. You did well in centering the flower against the darker area behind it. Making use of that big yucca worked well, didn’t it? It amused me to think of it as back-darkening rather than as back-lighting. I agree with Steve. The dark behind the yellow looks stunning. It took a little squirming around in the grass, but I was happy with the result. Two other photos from the same perspective show increasing levels of detail in the yucca and grass blades, but I’m especially fond of this one. Beautiful flower and excellent photo! It makes me happy to see someone else being excited by finding a natural treasure like that. It is a beautiful flower. There were white rain lilies scattered around the refuge, but this was the only yellow one I encountered. It certainly made me happy. Haha, yeah, back darkening :) This is a lovely shot. I’m glad you like it, Melissa. One lesson I’ve learned is that no matter what I set out to see, there’s always a little something extra that shows up: unexpected and wholly delightful. Yes, what a gift life always is. Oh Linda, that is a treasure. Don’t you love it when you discover something like that so unexpectedly? It makes what was already a good trip all the more so! Best of all, it was only the first of several lovely sightings, including one that made me think of you. I found my first juvenile blue heron. It was nearly beyond the range of my lens, but at least I could capture the two distinguishing features of the young ones: the mottled feathers on the neck, and the two-toned bill (black above and yellow below). I wasn’t sure at first if the bird was young, or molting, but the good bird sites confirmed that it’s a youngster. Now if you see one that looks like this, you’ll know. Keep your eyes open! I would love to see a juvenile. It would mean Harry and Harriet had a thing going on. Only I’m not sure if there are two of them anymore. Haven’t seen any in awhile. Bad timing, I guess. My neighbor has a whole flower bed of these in her front yard. With all the rain this year, they have been glorious. She bought a few bulbs years ago at a local Master gardener’s sale, apparently planted them in the perfect spot and they have multiplied like crazy – hiding until they decide it’s time to take the stage and shine. Mom had a couple that just showed up in her yard. She used to stake them when they appeared to keep dad from mowing over them as you never saw them until it rained. A painter couldn’t have brushed a more perfect background for that blossom. Nicely done! If your neighbor has a flower bed filled with them, and she planted from bulbs, I wonder if she might have Zephyranthes citrina. The Z. citrina is native to Mexico, and has naturalized here — sometimes with a vengeance, as in your neighbor’s yard. The differences among species are slight, especially for people like us, but it was fun to find a native one. After reading through this Pacific Bulb Society page,, I’m fairly well convinced the ID in my earlier post is wrong. Now that I’ve learned more about the differences among the species, I need to start over from the beginning, and see if I can sort them out. Some are beyond me (say, the difference between 48 chromosomes and 14) but some can be photographed — whenever I come across the flowers, of course. Next time it rains either I’ll have to get a better pix or you’ll have to come by to see. Her builds have be sparse and never done well until all the rain this year. They seem to just decide where to locate themselves – for a while there was a lone one in the grass which kept it’s head down most of the time to avoid the mower! Oh, mowers. I went down to a vacant lot near Pirates’ Beach last week to photograph some white bluebells. I waited exactly two days to return after spotting them, and I was too late. Every inch of that lot had been scalped. So it goes. It’s for sale, and I suppose they want it to be tidy for prospective buyers. Can’t see the land if plants are cluttering it up: realtors/developers’ code? Rain lilies are the magical flower that suddenly appears, last a few days and then are gone with the blink of an eye. My son has some that appear more yellow than these but then that’s probably my misconception. I like your photo very much. I’ve seen some variation in color myself, Yvonne, even though I haven’t seen many yellow rain lilies. I’ve read that there’s one species that’s much darker yellow, and one that’s more lemony. I suppose even within the same species there’s some variation in color, just as there is with garden flowers. In fact, I’ve found several white flowers among blooms that usually are blue or pink. It always tickles me when I do. I’m glad you like the photo. It was mid-morning when I found it, so the yucca in the background helped to tone down the bright sunlight. I’ll agree with the crowd: gorgeous shot of a beautiful flower. Well done! Thanks, Tina. I still laugh when I think of that little flower just blooming away, all by its lonesome. Maybe if the word got passed to the maintenance crew, it will have a chance to make some seeds. What fun it would be if two sprouted up next time — or a half-dozen. There were a lot of white rain lilies (Cooperia pedunculata) around in areas that won’t be mowed. Some already had produced seed, but there were quite a few blooming. I’m going to see if I can figure out how long it takes rain lilies to make their seed. Very pretty, Linda. My rain lilies are sort of lilac to purple, but I don’t have any blooming today. I’ve seen pink ones, but not lilac to purple: how pretty they must be. Even though our climates are similar, it’s interesting to me how different some of our flowers are. When I visited the Keys, I really was surprised to see so many trees and shrubs that I’d only seen in West Africa. I wasn’t interested enough at the time to question how they’d arrived here, but it was funny to have Florida plants reminding me of my Liberian home. Oh, wow, Linda! The way you have framed this with the background the lily looks like it is glowing! And the light essence you have captured within its delicate fold is pure beauty. You’re too kind, Pete. On the other hand, this was one of those times when I knew what I wanted to do, and actually pulled it off. It doesn’t happen often, but it’s happening more often, and every time I learn something new. It’s fun, and photos like this are their own reward. Taking photos of flowers must be so exciting when looking at the above result. I only use the camera on my old iPhone. Even so, I still get a kick out of it, especially when one doesn’t have to wait a week for the film to be developed. I well remember waiting for photos to be developed, and the cost of it all. For most of my life I was a point-and-shooter, a taker of snapshots. There’s not a thing wrong with that, but it’s been interesting to begin learning how to use a camera to produce a different sort of photo. It’s fun being out at the refuges, too. On the 4th, I actually was asked, “Are you a bird person or a flower person?” Usually, the lens on the camera’s the giveaway. Flower people have little lenses; bird people have big, bigger, and humongous lenses. You can buy a decent used car for the price of some of those lenses. I’ll just wait for the bird to come closer. I love the name “Rain lily” and what a lucky break to find a native one – sounds like it’s not common at all. It looks like it’s celebrating! It’s one of the most accurate flower names I know, at least in terms of a plant’s behavior. They’re really quite amazing, popping up like they do. Around here, at least, they’re often separated from the rain event by a few days, so it can be startling to find them appearing when I’ve already forgotten that we had rain. The yellow ones may be more common than I know, but it seems as though the naturalized far outnumber the natives. In either case, they’re always delightful, and demand to be given attention. What a wonderful yellow color! I love how you were able to capture the luminosity of the petals. It’s not a color I would wear, but that doesn’t stop me from delighting in it whenever I see it. It is a lovely, pure yellow, isn’t it? There’s something about a splash of yellow that always makes me smile. I suppose that’s a good part of the appeal of sunflowers, too. There are so many native yellow flowers I hardly can sort them, but I have to say that, for color, this one does stand out. Beautiful. Re the squirming in the grass for the sake of a good photo; do you encounter jiggers as Steve does? Oh, my. Yes. Also: fireants and mosquitos, and a tiny, flying irritant called a “no-see-um.” This year’s new treat was the bumblebee I irritated while photographing the basket-flowers. I had no idea bumblebees nest in the ground, or that they can sting repeatedly. I think the equivalence must be something like: a hundred chiggers = one bumblebee. My pro tip? Carry the benadryl in your camera case. For the last decade I’ve made sure to carry a little tube of hydrocortisone in my camera bag. That cream sure comes in handy for fire ant bites and nettle stings. I usually take an internal antihistamine (fexofenadine) as a precaution before heading out into nature. Believe it or not, I’ve never used hydrocortisone cream. It would be a good thing to add to my armamentarium, particularly since the grasses are so thick now that avoiding fire ants is more difficult. On a recent, particularly memorable afternoon, I actually sat on a fire ant mound — although not for long. I try to be attentive, but now and then enthusiasm overcomes caution. These ‘horror’ stories add a new light to your photographs! I have not been stung by a bumblebee but I have heard about its fierce sting from another friend who had the misfortune to disturb a nest. I didn’t understand until after it was over that, unlike a honeybee’s barbed stinger, the bumblebee’s is smooth. That’s why it can inflict so much damage in such a short time by stinging repeatedly. It’s an efficient little home defender, that’s for sure. But for the most part, they’re as placid as can be. In all the time I spent photographing the basket-flowers, with bumbles buzzing all around, it was clear they didn’t care one bit about my presence. And like the cicadas, their constant buzz is a nice, summery sound. What a great photo of a lovely find, Linda! I’m glad you went back to capture this one. It never ceases to amaze me the variety of shows Mother Nature puts on! Ponder this, Debbie. I learned today that there are about 350 native bee species in Texas. I could spend the rest of my life just with the bees, and never run out. If I live twenty more years, I’d could learn a new bee every twenty days. It’s completely amazing, the variety and richness that surrounds us. Of course, it’s a lot more fun to go wandering, and try to figure out what I’m seeing. That can take a little time, too, but the identification and the sharing are satisfying. Speaking of: how are your projects coming along? Don’t be shy about sharing the process with us. We’re all interested, and eager to lend support. It’s amazing how tweaking just a tiny bit in one direction or another can transform a ‘normal’ image into a stunning and unique one. Grrrrrrrreat discovery and great capture! I was back at the refuge today, and wouldn’t you know — the mowers have been there. Of course they leave most of the place unmowed, except along the roadways, at intersections, and so on, but the lily had chosen the wrong place to bloom: right in front of the visitors’ center. I hope it had time to go to seed before they did it in. Being able to engage in transformational tweaking (!!) is due in large part to learning and experience. Three years ago, I wouldn’t have recognized the lily as something special, and three years ago I couldn’t have taken this photo. It’s amazing, really — and I know it’s an experience you’ve had, too. it burns, however, in our memories.. I hadn’t thought of that, but it does have that look, doesn’t it? I wouldn’t have the faintest idea how to begin applying a watercolor wash, so it’s nice that I could do it with the camera.